Description: This Basic Plant Hanger is an easy Macrame pattern, suitable for beginners. 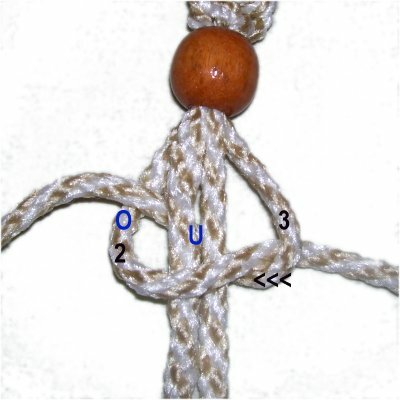 It features three types of basic decorative knots. Make sure you practice them before you get started. You can add beads, decorations, or additional knots to add character. The Cradle is designed to support any size pot. Finished Size: Approximately 44 inches tall, which includes the fringe. 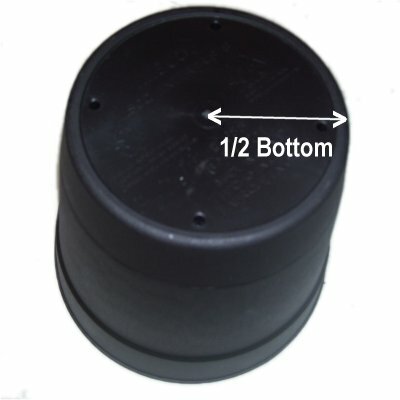 Measure the width of the plant pots are using, in the widest area at the top edge. Use this measurement to determine the number of cords to cut for the Basic Plant Hanger (below). Prepare the tips of the cords to prevent unraveling. Using tape is recommended, since it helps when applying the beads. When using tape, compress the tips so they are as narrow as possible. Step 1: Pass half of the cords through the 2-inch ring, while holding the ring upright. They should dangle over the bottom of it. Match the ends of each cord as you pass it through, so it is balanced. Do the same with the remaining cords, placing them on top of the first group. 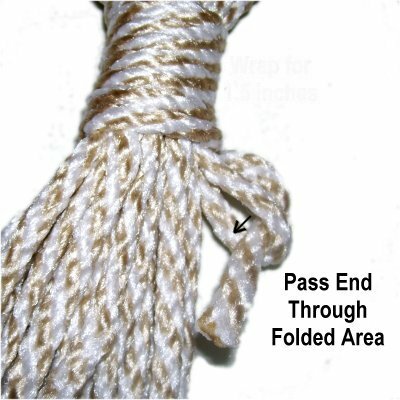 Start a Wrapped Knot tying an Overhand knot at one end of a 36-inch cord. Secure it next to the ring. 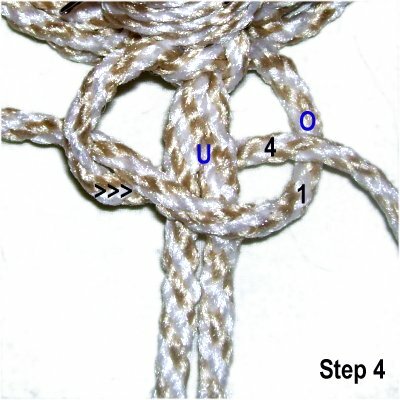 Fold the cord 3 inches below the knot, then bring it back up so the long portion is to the right (outside). Secure it at the fold. Wrap the long portion around the cords on the ring several times. Make sure you wrap firmly, until the knot is 1.5 inches long. Pass what's left of the long portion through the folded area, which looks like a loop. 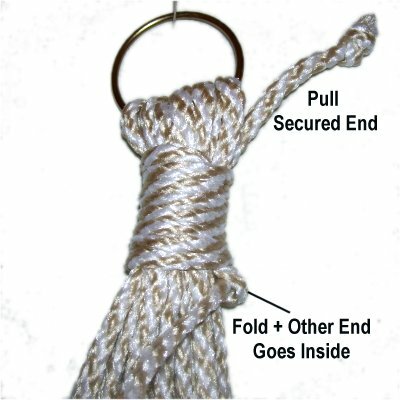 Pull the secured end, which has the Overhand knot. 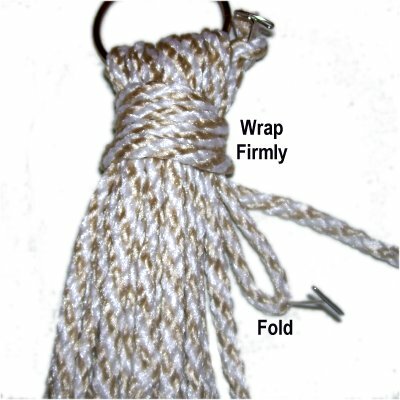 The fold and the other end will be pulled inside the bottom of the Wrapped knot. Make sure you pull it half way through the knot. Cut off the excess material from each end of the cord used to make the Wrapped Knot. Be careful not to cut the long cords on the ring. Tuck the stubs inside the knot so they can't be seen. Divide the cords into groups of 4. There will be either 5 or 6 groups, depending on what you cut in Preparation. Bundle each group by wrapping all 4 cords around your hand several times. Secure with a rubber band. Step 2: Mentally number the four cords in one group. The fillers are 2 - 3, and the working cords are 1 and 4. 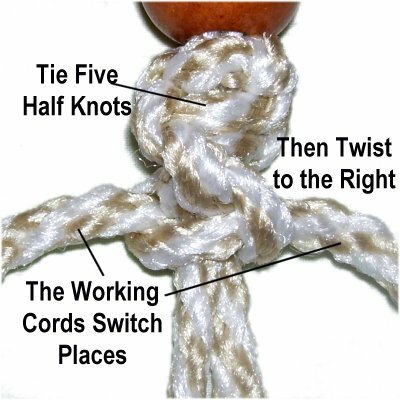 Continue tying Square Knots to create a sennit. Push the knots close together as you progress. Tighten each knot firmly. Stop when the sennit is 11 inches long. Repeat step 2 with the remaining groups of four cords. 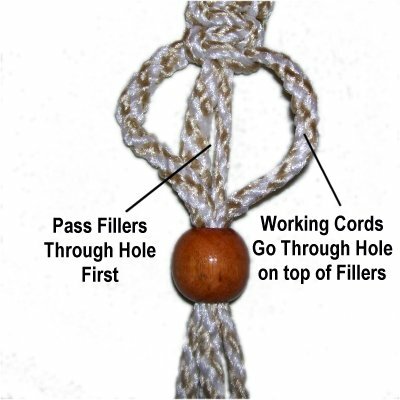 Pass both fillers (cords 2 - 3) through the hole first. Pass each working cord (1 and 4) through the hole, positioned on top of the fillers. 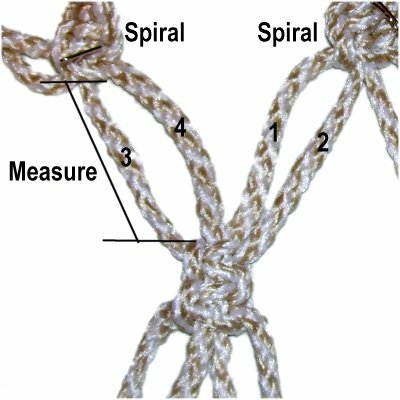 Before you move on to the Spiral design for your Basic Plant Hanger, arrange the longest cords (2 and 3) on the outside, since they are the new working cords. The shorter working cords (1 and 4) should rest between them, as shown in the images below. They now become fillers. 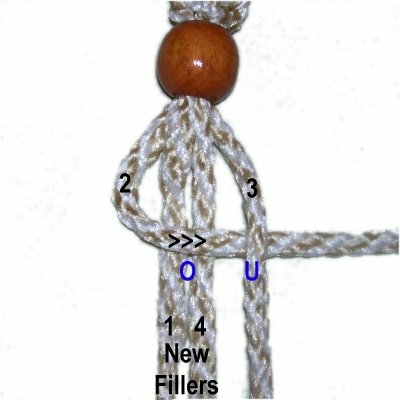 << Move working cord 2 to the right, over the fillers ( 1 and 4) and under working cord 3. 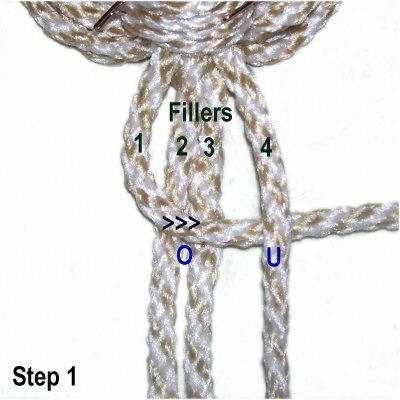 When making the Spiral Stitch for your Basic Plant Hanger, you should tie 5 Half knots, then twist the knots to the right while holding the fillers steady. The working cords should switch places. Repeat this step as you continue making the sennit. 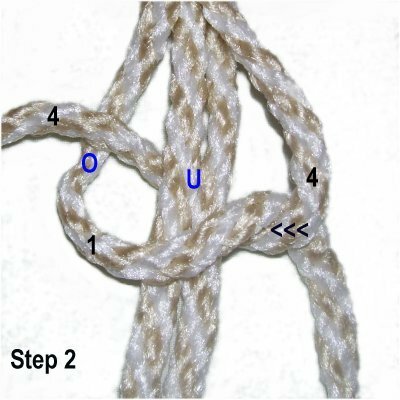 Step 4: Tie a Spiral Stitch design by tying a series of Half Knots as described above. Stop when the sennit measures 11 inches. Finish by tying the second half of the Square knot. 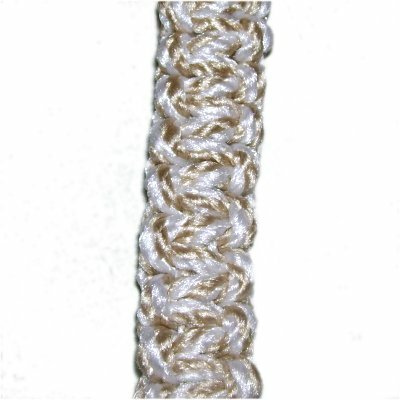 The Spiral Stitch was the first half of a SK, so you simply change direction to make the second half. Step 5: Repeat steps 2 - 4 for each group of cords bundled in step 1. Now you will make the Cradle at the bottom of the Basic Plant Hanger. 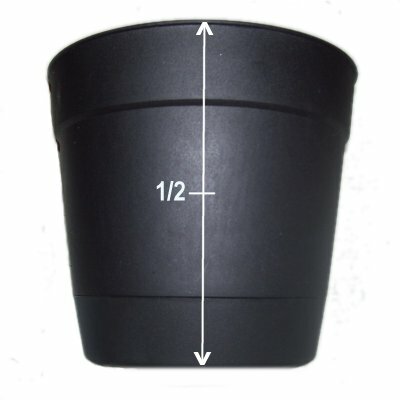 Measure the plant pot, and find the half way point by dividing the total height by 2. So if the pot is 6 inches tall, the half way point will be 3 inches. Use this measurement in step 6. 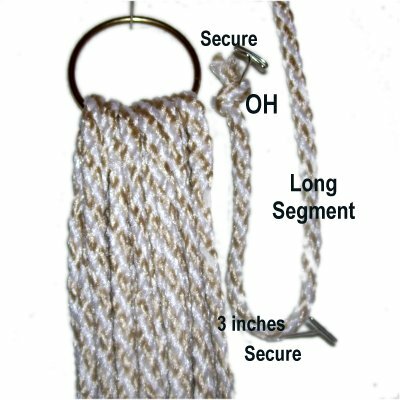 Locate two Spiral sennits that rest next to each other, and secure them side-by-side. Make sure the Square Knots at the top are not twisted. Mentally re-number the cords in each sennit 1 - 4. Step 6: Alternate by selecting cords 3 and 4 from the left sennit, combined with cords 1 and 2 from the right sennit. Measure from the bottom of the Spiral sennit down to the place that would be the half way point on the pot (see previous image). Tie two Square Knots at that point. Step 7: Repeat step 6 using the remaining cords. This is much easier if you suspend the Basic Plant Hanger by the ring at the top. 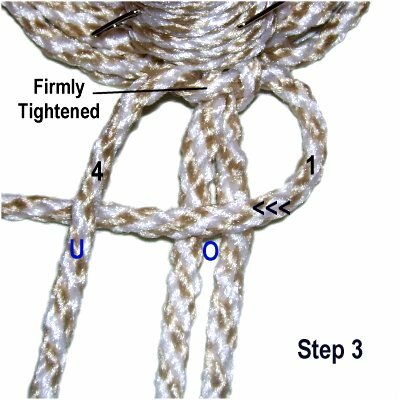 Make sure the sennits are not twisted, and that you are combining cords from two sennits that rest next to each other. Step 8: You now need to alternate the cords again, as described in Step 6. Start by mentally re-numbering the cords coming from two sets of SK tied in the previous step. Measure from the bottom of the SK tied in step 6, down the same distance as in step 6. This way the next knot rests at the lower edge of the pot. Repeat steps 6 and 7, but tie only one SK. 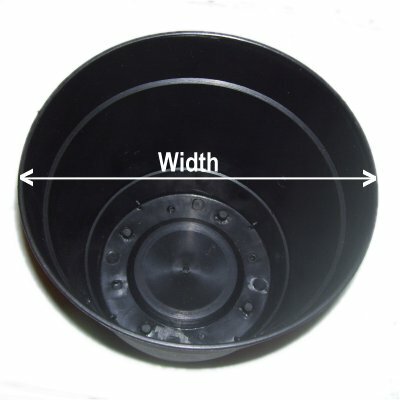 Step 9: Measure the bottom of the pot, from the edge to the center (1/2 the bottom area). Tie additional SK just below the one tied in step 8, until you reach the measurement you came up with. Tie all the knots firmly to eliminate any space between them. Step 10: Repeat steps 8 and 9, using the remaining cords. Organize all the cords at the bottom of the Basic Plant Hanger. Match the knots made in the cradle (middle and bottom of pot). Step 11: Tie a Wrapped Knot around all the cords, as you did in step 1. After tightening it, place the pot in the Cradle. 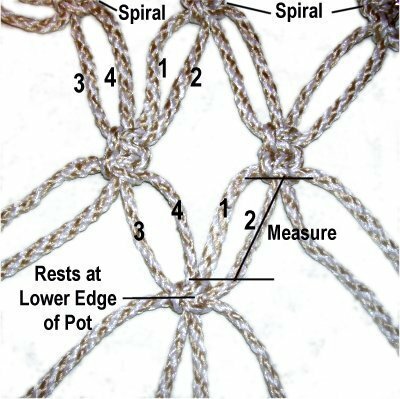 The knot should rest in the center of the pot. Make adjustments as needed. 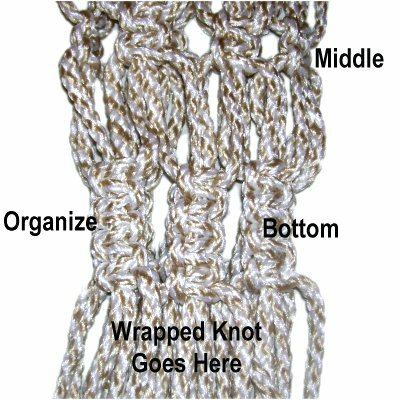 Important: Pull on each cord to eliminate any space between the Wrapped Knot and the SK. Cut off the excess material from the cord used to make the Wrapped knot, and tuck the stubs inside so they can't be seen. Step 12: Trim the ends of all the cords so they are even. When using Bonnie Braid or Nylon, heat the tips with a flame, which prevents fray. 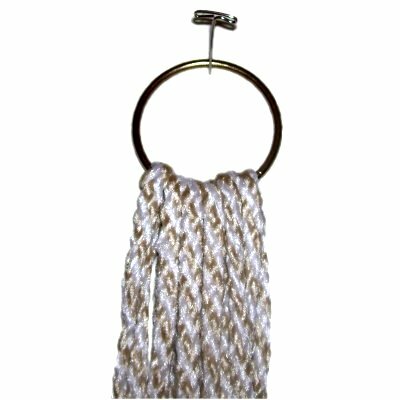 For other materials, you have the option of tying finishing knots, or to unravel and brush to create a brushed fringe for your Basic Plant Hanger. Have any comments about the Basic Plant Hanger? Contact Me.